The Blamsoft lab is set up to take measurements of music hardware. 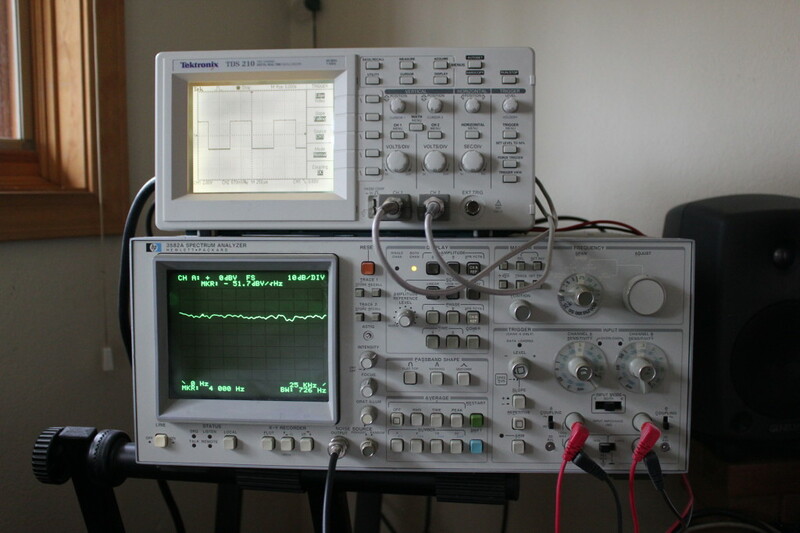 The main workhorses are a Tektronix TDS 210 oscilloscope and a Hewlett Packard 3582A Spectrum Analyzer. Tektronix is considered to be the best oscilloscope maker, and HP is highly regarded for spectrum analyzers. The spectrum analyzer is from the 1980s but was designed specifically for audio circuits so it is still sought after. The measurements for Viking were taken using these two pieces of equipment. The oscilloscope measures time domain waveforms so it was used to match the oscillators to the analog counterpart. The spectrum analyzer measures frequency domain magnitude and was used to match the Viking filter response to the analog filter response. In addition to the electronic test instruments, Blamsoft has high quality flat response Earthworks QTC40 microphones and a super clean Millenia preamp that may be used to analyze recorded sound in a future Rack Extension. Happy new year! I got a request that could very well add to your modular setup. If you could add an Arp filter and a Oberheim filter in separate units that would give people a chance to experience those like the Moog in the viking filter. Thanks I ran out of money during Christmas but I have everything but the modular system. Will be purchasing this summer Lord willing. Oh one more thing could you make a cry baby wah; RE that would make up my guitar rig.